DJ Spooky at NYC Loving Day Celebration ? Now With Net Neutrality! You might have seen the various press announcements about our upcoming Rock the Net CD, which features Wilco, Aimee Mann, Bright Eyes, Portastatic, They Might Be Giants, DJ Spooky and more. The disc comes out on July 29 on Thirsty Ear Records. DJ Spooky, who donated the track “Uganda” to the compilation, is playing a show on June 8 in New York City as part of the nationwide Loving Day events. The free, all-ages concert celebrates the 41st anniversary of Loving v. Virginia — the landmark Supreme Court case that legalized interracial relationships in the United States. To RSVP, send an email to lovingdayparty [at] gmail [dot] com. Spooky also wanted to use the occasion to raise awareness about net neutrality, so he’s offered to make available Rock the Net materials to concertgoers. We thought it was a fine idea. 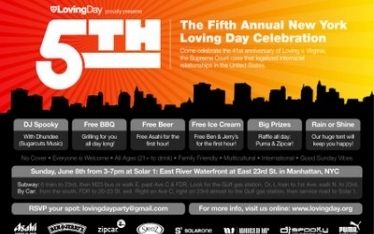 Loving Day NYC — Sunday, June 8th from 3-7pm at Solar 1: East River Waterfront at East 23rd St. in Manhattan. FREE BBQ Grilling for you all day long! Free Asahi beer the first hour! Free Ben & Jerry’s for the 1st hour! Raffle all day: Puma and Zipcar!